IT WAS a remarkable first novel and the critics were lavish in their praise. Robert Galbraith’s detective story, The Cuckoo’s Calling, had marked him out as a writer to watch. The book reminded the crime writer Val McDermid of “why I fell in love with crime fiction in the first place”. On the novel’s back cover, Mark Billingham, another crime writer, described its central character, Cormoran Strike, a private eye, as “one of the most unique and compelling detectives I’ve come across in years”. The publisher’s website claimed Galbraith was a pseudonym for a former plainclothes Royal Military Police investigator who had left in 2003 to work in the civilian security industry. In fact, none of that was true. The author is JK Rowling, writer of the bestselling Harry Potter series. With The Cuckoo’s Calling, Rowling, who last autumn published a successful adults’ book, The Casual Vacancy, had pulled off another coup: she had switched genres, written a book anonymously and produced yet another hit. 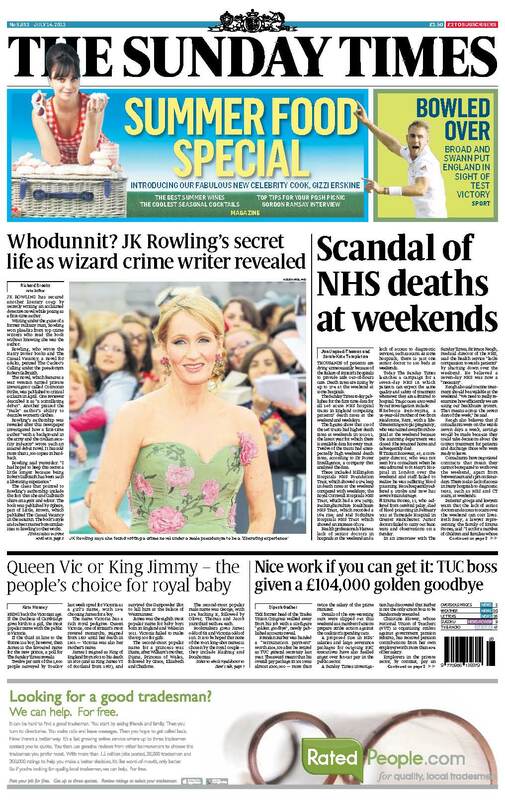 Rowling was rumbled three months after the book was published and admitted she had enjoyed the anonymity. “I had hoped to keep this secret a little longer because being Robert Galbraith has been such a liberating experience,” she said yesterday. Rowling spoke of how the pressure on her had grown ahead of the publication of each Harry Potter book and then with The Casual Vacancy, her first non-Potter novel. “It has been wonderful to publish without hype or expectation, and pure pleasure to get feedback under a different name,” she said. Her editor, David Shelley, had been “a true partner in crime”, she said. The novel tells the story of Strike, a war veteran turned private eye, who investigates the death of a model who falls from a snow-covered balcony in Mayfair. Rowling has mentioned her interest in detective books in the past, singling out the work of Dorothy L Sayers, the creator of gentleman detective Lord Peter Wimsey. For literary sleuths, there were many other clues to her authorship of The Cuckoo’s Calling. She and Galbraith have the same agent, Neil Blair of the Blair Partnership. Galbraith is the only client who does not have a photograph — merely a silhouette — on the agency’s website, which includes pictures of the designer Pearl Lowe and the footballer Frank Lampard. The novel was published by Sphere, an imprint of Little, Brown, which published The Casual Vacancy. However, Rowling’s first adult novel received mixed reviews — not as uniformly good as The Cuckoo’s Calling. There were other clues. Shelley, Galbraith’s editor at Sphere, oversaw The Casual Vacancy. As Little, Brown’s publisher, he is the company’s most senior editorial figure, and it is unlikely that he would look after an unknown first-time writer. 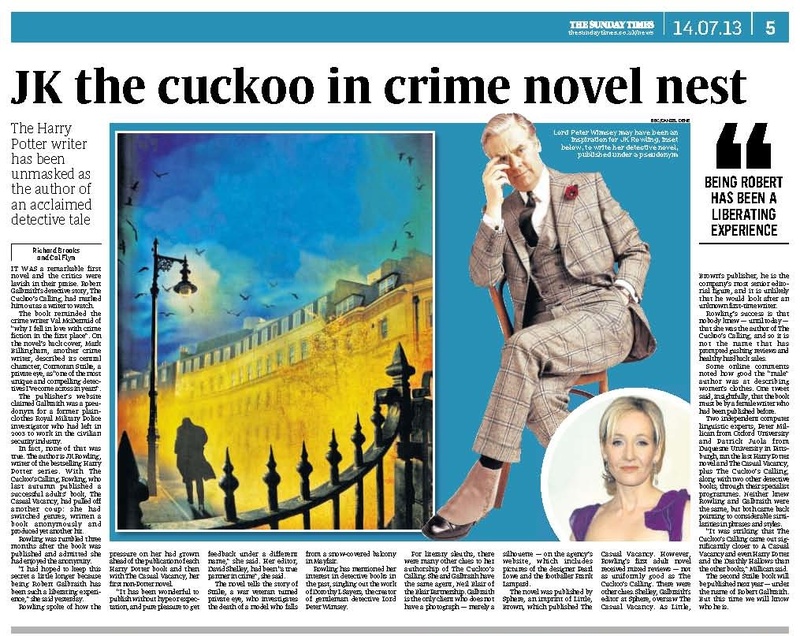 Rowling’s success is that nobody knew — until today — that she was the author of The Cuckoo’s Calling, and so it is not the name that has prompted gushing reviews and healthy hardback sales. Some online comments noted how good the “male” author was at describing women’s clothes. One tweet said, insightfully, that the book must be by a female writer who had been published before. Two independent computer linguistic experts, Peter Millican from Oxford Universityand Patrick Juola from Duquesne University in Pittsburgh, ran the last Harry Potter novel and The Casual Vacancy, plus The Cuckoo’s Calling, along with two other detective books, through their specialist programmes. Neither knew Rowling and Galbraith were the same, but both came back pointing to considerable similarities in phrases and styles. “It was striking that The Cuckoo’s Calling came out significantly closer to A Casual Vacancy and even Harry Potter and the Deathly Hallows than the other books,” Millican said. The second Strike book will be published next year — under the name of Robert Galbraith. But this time we will know who he is.